These Jazz Punks are the real deal. The mission statement of Jazz Punks is essentially to draw things together. It’s easier said than done, of course, but with Smashups this Los Angles band manages to tie various musical styles and genres together without sacrificing any integrity. The art not only doesn’t suffer, it benefits. When Jazz Punks hammer a pair of Radiohead tunes to a Billy Strayhorn classic, all of the pieces of music involved benefit from the larger experience. The commonalities between numbers become apparent and the music blends to broaden the net, so to speak. Indeed, the description is apt. These are big tunes and they reach for the back rows, with Elliott, pianist Danny Kastner, saxophonist Robby Elfman, guitarist Sal Polcino, and bassist Mike Polcino throwing nothing but heat with every pitch. Far too often, the notion of doing a “jazz take” on a pop or rock classic generally intones some brand of conversion. The pop/rock track becomes jazz; it doesn’t become another creation. This approach typically yields dull results, but Jazz Punks have no interest in tedium or mere adaptation. This is Smashups, after all. What we end up with, then, is “Creep Train.” This piece is an enchanting mingling of Radiohead’s “Creep” and “Paranoid Android” with Strayhorn’s “Take the ‘A’ Train.” The track opens with Kastner’s piano and quickly transforms into the familiar riff from “Paranoid Android,” building into a greater epic with each passing note and tempo change. Then there’s “I Can See Miles,” a blistering mash-up of The Who and, of course, Miles Davis. The connecting tissue between “I Can See for Miles” and “No Blues” is staggeringly strong. And, for good measure, Polcino blows the doors off with a guitar solo. No word on if the Jazz Punks smashed the hell out of the set after the song, though. Another highlight is “Led Gillespie,” melting “Misty Mountain Hop” into Dizzy Gillespie’s “A Night in Tunisia.” The familiar cadence of the Led Zeppelin tune works wonderful with the tempo shifts and melodic playing from Elfman, creating a larger whole that is far more than just the sum of its parts. It turns out that these Jazz Punks are the real deal. 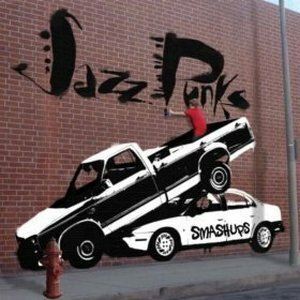 Smashups is not just another homage record filled with covers turned through a jazz filter. This is unique stuff, but it doesn’t abandon the foundations of any musical genres. It is, as mentioned, “stadium jazz” for the masses. And it’s fun, too!